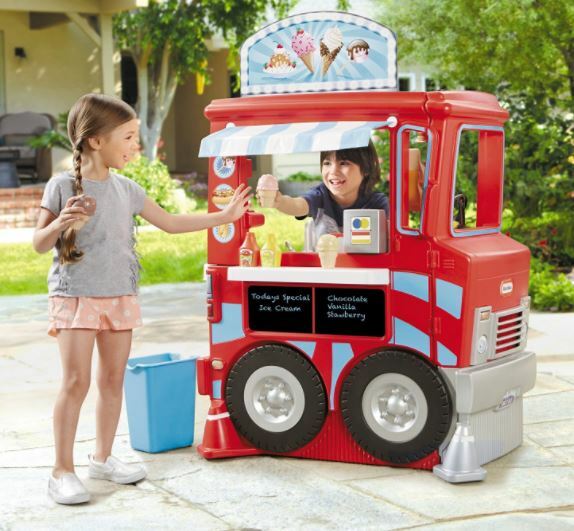 How adorable is this Little Tikes 2-in-1 Food Truck on sale for $89.99 shipped (Retail $159.99) – lowest price ever! This stationary food truck also doubles as a play kitchen! It includes a reversible sign so your kiddos can have an ice cream or hot dog stand! It also has customizable chalkboard with chalk, cash register, order notepad, “Order up” bell, steering wheel with working horn, trash bin, serving counter, play soda fountain, oven, microwave and fridge AND 40 utensil accessory pieces!